Since October 2017, a study has been underway to examine the use of variable-speed tunnel fans to reduce fan operating cost. 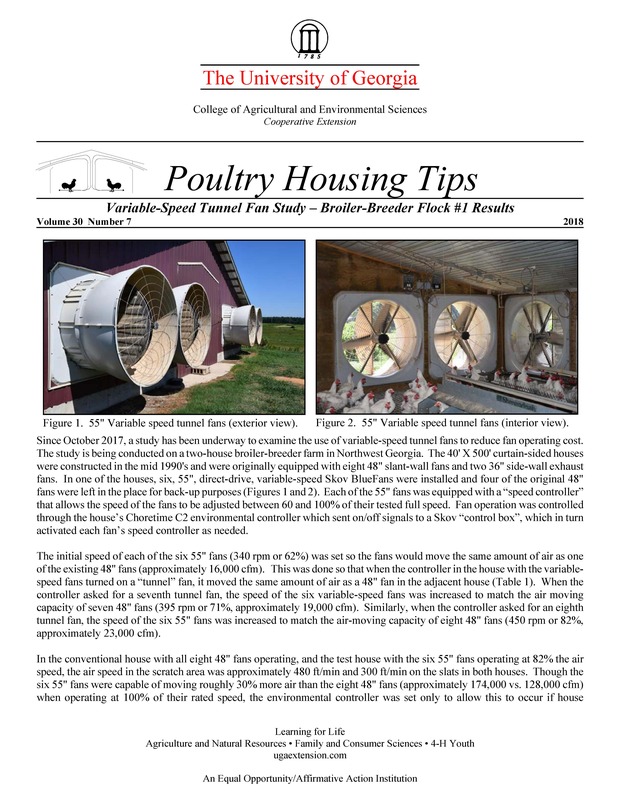 The study is being conducted on a two-house broiler-breeder farm in Northwest Georgia. The 40' X 500' curtain-sided houses were constructed in the mid 1990's and were originally equipped with eight 48" slant-wall fans and two 36" side-wall exhaust fans. In one of the houses, six, 55", direct-drive, variable-speed Skov BlueFans were installed and four of the original 48" fans were left in the place for back-up purposes (Figures 1 and 2). Each of the 55" fans was equipped with a “speed controller” that allows the speed of the fans to be adjusted between 60 and 100% of their tested full speed. Fan operation was controlled through the house’s Choretime C2 environmental controller which sent on/off signals to a Skov “control box”, which in turn activated each fan’s speed controller as needed. The initial speed of each of the six 55" fans (340 rpm or 62%) was set so the fans would move the same amount of air as one of the existing 48" fans (approximately 16,000 cfm). This was done so that when the controller in the house with the variable-speed fans turned on a “tunnel” fan, it moved the same amount of air as a 48" fan in the adjacent house (Table 1). When the controller asked for a seventh tunnel fan, the speed of the six variable-speed fans was increased to match the air moving capacity of seven 48" fans (395 rpm or 71%, approximately 19,000 cfm). Similarly, when the controller asked for an eighth tunnel fan, the speed of the six 55" fans was increased to match the air-moving capacity of eight 48" fans (450 rpm or 82%, approximately 23,000 cfm). In the conventional house with all eight 48" fans operating, and the test house with the six 55" fans operating at 82% the air speed, the air speed in the scratch area was approximately 480 ft/min and 300 ft/min on the slats in both houses. Though the six 55" fans were capable of moving roughly 30% more air than the eight 48" fans (approximately 174,000 vs. 128,000 cfm) when operating at 100% of their rated speed, the environmental controller was set only to allow this to occur if house temperatures exceeded 83oF. The downside of the six fans operating at full speed was that the total fan power usage increased to approximately 8,100 watts, essentially the same amount of power used by eight 48" fans, thus eliminating any potential power savings. It is important to note that the objective of the study was not to increase the air speed in the house with the new fans, but to match the air-moving capacity of the existing ventilation system with dramatically more energy efficient fans. Broiler-breeders were placed on the farm at the beginning of October 2017 and were removed at the end of July 2018. Each of the tunnel fans was equipped with a power meter which was connected to an online data logging system which recorded power usage on a 15 minute-basis over the course of the flock. In both houses, the environmental controllers were programmed according to poultry company guidelines. The “tunnel” fans were used when the house was both in side-wall-inlet mode as well as tunnel-ventilation mode. Minimum ventilation was provided by operating a “tunnel” fan along with a single side wall 36" fan operating on a five-minute-interval timer. Power usage of the 36" fan was not recorded. The 55" variable-speed fans performed very well over the course of the flock with only one minor issue. Originally after a fan would shut off, it would take over 30 seconds for the motorized fan shutter to completely close. Though this was not an issue during the summer, during cooler weather it resulted in lower temperatures in the vicinity of the tunnel fans. Approximately two months into the flock, a slight modification was made to the motorized shutters to decrease the closing time to approximately 15 seconds. The latest version of the fan’s motorized shutter is designed to close in approximately 10 seconds. No problems were encountered related to variable speed control aspect of the fans. Despite the fans not being cleaned, there was no significant decrease in air speed in the house with the 55" direct drive, variable-speed fans over the course of the flock. The same could not be said about the air speed in the house equipped with 48" fans, which decreased approximately 20% (410 ft/min in scratch area, 215 ft/min on the slats) over the course of the flock. Roughly 5% of the reduction in air speed could be attributed to belt wear; 15% was attributed to dust accumulation on the fan shutters (Figures 3 and 4). One interesting difference between the two houses noted by the farm owner was that when the 55" variable-speed fans were operating at 340 rpm, moving the same amount of air as a 48" fan, they were much quieter than the 48" fans. In fact, he commented that most of the time he couldn’t tell from just listening when he entered the house if any fans were operating. When all six 55" fans were operating at near full speed, the fan sound level in the two houses was similar. The variable speed fans used approximately 65% less power from October through April, which decreased to 43% during July (Figure 5). The higher reductions in power usage were obtained during the cooler months because the six 55" variable speed tunnel fans were always operating in their most energy-efficient mode, namely running at 62%, moving 16,000 cfm. In the spring, power savings decreased as temperatures started to climb during the day. At night, when generally less than six fan was operating, power usage was reduced by 65%. But, during the afternoons when the equivalent of seven or eight 48" fans were often required to keep the birds comfortable, power savings were reduced to between 40 and 50% (Figure 6). During June and July when the variable speed fans operated most of the day and night in the higher output modes (moving the same amount of air as seven or eight 48" fans), power savings were further reduced to between 40 and 45%. One complicating factor as noted previously was that when house temperatures exceeded 83oF, the 55" variable speed fans were programmed to operated at 100% of their rated speed. Though this increased the average air speed in the house by roughly 30% compared to what was seen in the house with the 48" fans, the downside was that total fan power usage increased to 8,160 watts, which was the same as the amount of power used by the eight 48" fans in the adjacent house and as a result there were no power savings during these periods of time. Over the course of the flock, there were 96 hours when the six fans operated at 100%, or roughly 1% of the flock. As a result, the overall effect on overall flock fan power usage was minimal and was confined to the months of June and July. Figure 7 shows the total fan operating cost over the course of the flock calculated from the power usage of fans multiplied by the cost of power per Kw-hr, which varied from low of $0.065 during February to a high of $0.135 during June and July. Over the course of the flock the average power cost was calculated to be $0.105 per Kw-hr. As expected, total fan operating costs were low in the cooler months due to the combination of minimal fan runtimes and very low electricity rates. During the summer months, daily fan operating costs increased approximately tenfold due to the majority of fans operating long hours each day and the fact that electrical rates were approximately twice that compared to the cooler months. The total flock fan operating cost can be found in Table 2. An adjusted fan operating cost is provided in the table to illustrate what the operating cost would have been had the variable-speed fans been not allowed to operate at 100%, thus keeping the maximum air speed/air exchange rates in both houses identical. Table 3 illustrates the projected flock fan operating costs assuming fixed electrical rates of $0.10, $0.15, and $0.20 per Kw-hr. At the current power rate, the use of the variable-speed 55" fans reduce fan operating costs over the 48" fans by roughly $1,000, or 54%. As with most breeder farms, fan operating costs will be affected by when a flock is placed. Since this flock was removed in essentially the middle of the summer, when the actual dollar savings of the variable speed fans were the highest, the savings were significantly lower than they would have been had the flock not been removed until the winter. Considering the variable-speed fans were saving approximately $10 a day during most of June and July, had the flock remained until the winter, it is easy to see where the savings could have been over $1,500. Another point to consider is that an average electricity rate of approximately $0.10 per kw-hr is relatively low, compared to other areas of the state and country which are often 10 to 20% higher and in some instances, such as California, rates are nearly twice as high. Had the farm been located elsewhere and had the birds been placed in the early spring, a strong argument could be made that the power savings associated with the variable speed fans could have easily saved the producer over $2,000. One last point to consider. The houses on this particular farm did not have a lot of fan capacity compared to most farms built recently. A newer house would tend to have enough fan capacity to obtain an average air speed closer to 600 ft/min than the approximate 400 ft/min seen on this farm. The increased fan capacity required to obtain an air speed of 600 ft/min would result in higher electricity usage and therefore greater dollar savings would be realized through the installation of the variable-speed tunnel fans. That being said, a newer farm would typically be equipped with fans with an energy efficiency rating of over 21 cfm/watt fans compared to the 17 cfm/watt 48" fans installed on this particular farm, which would slightly reduce the overall savings. But keep in mind that the variable speed fans would still dramatically reduce power usage over even a new fan due to the simple fact that they would be operating at an energy efficiency rating of between 30 and 45 cfm/watt and not 21 cfm/watt. 1) Economics. Though the power savings can be dramatic, variable-speed tunnel fans and their associated controllers can easily cost twice as traditional fixed-speed fans. The return on investment will vary based on a variety of factors such as electricity rates, bird placement date, house operation, house location, new house vs. old house, type of environmental controller, etc. 2) What is the optimal number of variable-speed fans to install? When variable-speed fans operate at full speed they tend not to be that much more energy efficient than many fixed-speed fans. The key to saving energy is installing enough fans. The more fans installed, the fewer hours they will operate at 100%, the greater the power savings. In this particular study the number of fans was determined to ensure that they could move the required amount of air while only operating at roughly 80% of their rated full speed, thus helping to ensure maximum power savings. The downside of course of installing a greater number of fans is that while power savings are maximized, initial cost is increased. Finding the optimal economic balance between these two factors can be difficult. 3) Control. Currently not all poultry house environmental controllers can be easily modified to properly control large numbers of variable-speed fans. For those capable of operating variable-speed tunnel fans there is the challenge of determining at what speeds the fans should be set to operate and at what temperature setting. Do you begin operating the fans at 60%, 65%, or 70%? Do you increase their speed in three, five, or ten stages? What is the maximum speed at which they will be operated, 85%, 95%, 100%? 4) Longevity/Reliability. Though variable-speed fans have been around for decades, the fact is large direct-drive, variable-speed tunnel fans have only been around for a year or two. As with any new product/concept it takes time to determine how long they will last in what can be a fairly challenging environment. Furthermore, will there be any unforeseen problems in a situation where lightning is a near constant threat during the summer months and power quality can be questionable at times.